The welfare effects of bankruptcy legislation are not correctly understood. Policymakers and the general public think, for the most part, that laws that protect borrowers in the event of default are beneficial to consumers. In practice, however, those laws have negative effects on the households that need credit most — and, ironically, those whom the legislation was intended to protect. Traditionally, Chapter 7 has been the most popular type of bankruptcy filing. Under that section of the Bankruptcy Code, a filer relinquishes her assets, minus a certain exempted amount, and in return is discharged from her unsecured debt (credit card debt, personal loans, student loans, etc.). State law sets those exempted amounts. In Illinois, for instance, exemptions are: $7,500 for home equity, $1,200 for motor vehicles, $750 for tools of the trade, and $2,000 for any other generic property. So suppose that you file for bankruptcy in the “Land of Lincoln,” and that you have $20,000 worth of home equity, and a car with a market value of $600. Then you can sell the house and keep $7,500 of the proceeds, and sell your car and keep the $600 (since that’s below the $1,200 limit). Since 1978, with the passage of the Bankruptcy Reform Act (BRA), there’s also a federal exemption. Some states allow filers to choose between the state and the federal amounts. Obviously, if given the opportunity, filers use whichever is highest. There is an enormous disparity of bankruptcy exemptions across states, even after accounting for the existence of the federal limits. For example, in 2006 the states of Texas, Florida, Oklahoma, Iowa, Kansas, South Dakota, and the District of Columbia, all allowed for an unlimited homestead exemption. In the states of Ohio and Virginia, at the other extreme, the limit is set at $5,000 (and those states don’t allow for the application of the federal exemption). 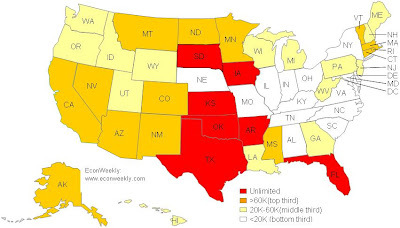 The map below shows the maximum exemption that a married homeowner could claim in 2003, after combining homestead and non-homestead amounts, and taking the highest of the state and federal limit (where the federal limit is available). The limits also vary over time, although high-exemption states tend to remain the same over the years. The amount of the exemption provides insurance for the debtor’s consumption. Suppose that a debtor suffers a setback, such as illness or unemployment, and that she is forced to default on her credit card debt and student loans. In the absence of any exemption, creditors would take a blanket security interest in all of the debtor’s possessions. The existence of an exemption means that she is left with at least a small amount of assets after filing for bankruptcy. Legislators see it as a way to provide a “fresh start.” An alternative view is that a certain amount of assets, and hence consumption, are insured against negative events. On the other side of the coin, lenders are hurt by this form of consumer protection. Higher exemptions reduce the payments received by the lender in the event of default, and increase the probability of bankruptcy, since the borrower’s punishment for doing so becomes smaller. Creditors rationally respond to higher exemptions by raising interest rates and rationing credit. This rationing may take the form of fewer households with access to debt, smaller loans, or both. Fewer and smaller loans reduce the amount of consumption that households can finance with debt in times of low income. 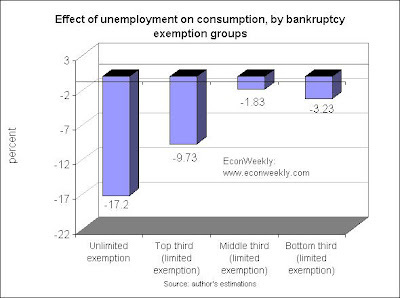 In theory, then, bankruptcy exemptions have an ambiguous effect on consumption smoothing. Higher exemptions allow bankrupt households to keep more assets; but those same higher exemptions reduce the supply of credit. It is, therefore, an empirical matter whether higher limits enhance or detract from the role of debt as a consumption insurance mechanism. To answer that question, I put together data on consumption and lay-offs of American households (from the Panel Study of Income Dynamics), as well as bankruptcy exemptions, for as many years as I could get consistent data for. (In practice, that is 1976 through 2003, with the exception of 1994-1997.) The idea is to estimate by how much a family’s consumption is reduced when its main income earner gets laid off, and see how much the hit to consumption changes with the bankruptcy exemption. My interpretation of the results is that consumer debt is an important mechanism of consumption insurance. People use loans and credit card debt not only to finance big-ticket items, but also to make ends meet when disaster strikes. Legislation that makes it harder to obtain debt, such as bankruptcy exemptions or interest rate caps, ends up punishing the weakest: people with low wealth, who could make the most use of credit as an insurance device. Don’t get me wrong: this is not a call to eliminate bankruptcy exemptions. There is a place for them as a means to provide safety to people who have been struck by unexpected events. A zero-exemption policy would probably expand credit supply — at the cost of leaving thousands of families destitute and without a chance to recover. But exorbitant homestead exemptions go way beyond providing a chance for a “fresh start.” Likewise, there’s no reason why people should be allowed to keep $60,000 worth of personal property, as they can do in Texas. Surely, medical expenses can easily run into the hundreds of thousands of dollars. But that’s a reason to reform health insurance. Limiting the enforceability of credit contracts is a bad way to lay out safety nets. This post was based on my own research. The write-up of the paper is still in the making. It will be available on my website by January 28. In the meantime, you can have a look at the slides I prepared for a presentation this Friday. How is your comment related to this post? Please explain, I'm genuinely curious. Which would the bankrupt actually prefer though, keeping assets or smoothing consumption? Which should the state prefer? More, tail of the dog may not be the best result. Punishing the bankruptee and bankruptor alike may make some sense. Is there any difference in success rates post-bankruptcy? Recurrence would be a strong point against a lack of exemptions. Perhaps I didn't express myself correctly, but a household that files for bankruptcy and keeps her assets is smoothing her consumption: she can sell those assets and use the proceeds to consume. Once the filing happens, there's no choice between keeping assets and smoothing consumption: they're the same thing. Could you explain how and why punishing lender and borrower alike "may make some sense"? As far as I can see, recurrence of bankruptcy filings would support ELIMINATING exemptions (at least insofar as the recurrence is the result of a moral hazard problem). Moral hazard goes in both directions. Someone borrowed money they couldn't repay and someone lent it to them. It may have been extraordinary circumstances or poor planning, bad judgment or greed. Both have created a problem the state must remedy. It is in the state's interest to see the problem remedied and for it not to occur again, insofar as reasonably possible. If no exemption led to more numerous and repeated bankruptcies, no learning is taking place. Someone needs to say something about this! http://www.fakepaycheckstubs.com IS THIS LEGAL? No wonder why we have the subprime mess we have when lenders USE FAKE DOCUMENTATION to help PUSH the loan through Quickly SO THAT EVERYONE DOWN THE FOOD CHAIN (from loan processor to the loan officer to the actual lender) can make the commissions they "WERE" making during the booming 90's!!! Now we are BAILING OUT THESE CROOKS....SOUNDS LIKE the good ol' 1980's Savings and Loan BAILOUT DAYS to me! http://www.fakepaycheckstubs.com see it with YOUR OWN EYES!